The 6913 motor stator test system collocates the MT-6913 and the 6905 tester. Optional 6420 LCR Meter for testing inductor. It is provided with eight 4-line independent measurement test points and 13 channels. 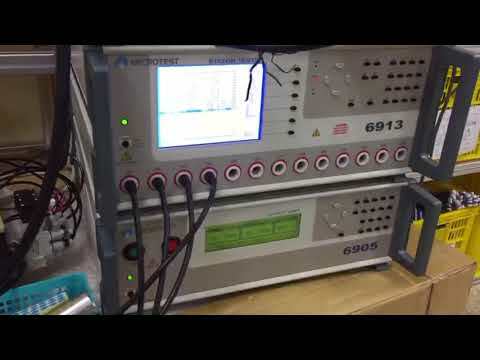 The testing projects include the DC resistance tests which may detect the errors of copper wires that is over-tight during winding, broken or connecting. Besides, the Hipot testing on the required safety regulations, and the client respect project of the Impulse/Surge are included as well. With the most advanced Impulse/Surge tester takes waveform comparison to avoid the Corona Phenomenon that is caused by possible damage. It provides a complete solution of standard test project to the international manufacturers and serves as a further checker for your products. The motor stator test systems that match up the programmable interface and the simple operation can be quickly imported into the production lines and the quality control center. Standard system is the Super Space-Saving Desktops Tester. Optional system is the Systematic Modular Cabinet Tester. Both the internal wire resistance and the contact resistance will not affect the measurement. Using the 4-wire measurement will be more accurate than others.